11 °C 50° 0 2 4 6 8 10 12 14 16 18 20 SEC. 150° 250° 350° °C 100° 50° 150° 200° 250° 300° 350° WP 80 14 sec. WP 120 WP 80 0 20 40 60 80 100 120 140 160 180 SEC. °C 400° 300° 200° 100° Soldering ■ Maximum power & rapid response ■ Optimized sensor position ■ Meeting highest industry standards ■ Widest tip range with low price point ■ Effective heat transfer via silver core ■ Fast ramp up & recovery ■ Designed for universal applications ■ Low mass tips with lowest price point ■ Fastest heat up & recovery on the market ■ Excellent reaction time with ﬁnest tips ■ Optimal for soldering under microscope ■ Rapid hot tip-change; no tool required The Manufacturer Warranty can ONLY be guaranteed when using original Weller parts. Ready for soldering in ONLY 3 sec. 30 % faster 65W up to 200W Capacity comparison Heating time Standard soldering iron 45–55 sec. Active-Tip Technology This highly innovative technology offers ultra precise hea- ting & temperature control speciﬁcally designed for micro- soldering applications. The fully integrated tip cartridge (40W ) delivers the fastest recovery on the market for ﬁne tips at just a slightly higher tip price. Temperature sensitive and miniature applications are mastered with precision & safety. Power-Response Technology The newly improved technology maximizes soldering performance on the smallest to the largest joints. 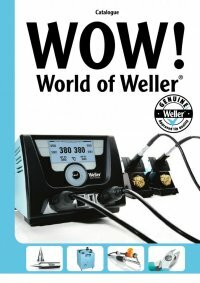 A perfect balance between power (65W, 120W & 200W), response, temperature control and lower tip costs makes this unique technology the most attractive solution - Top quality professional soldering designed to meet the highest industry standards. Silver-Line Technology The low mass silver tips offer the absolute best heat transfer at the lowest price in our entire range of tips. The 80W ergono- mically designed heating element and pencil type grip make this technology the top performer for universal soldering applications where tip price is a deciding factor.applications where tip price is a deciding factor.applications where tip price is a deciding factor.